This wrap around book with a strong cover is a useful place to take notes, collect samples, store images or use as a journal on trips. 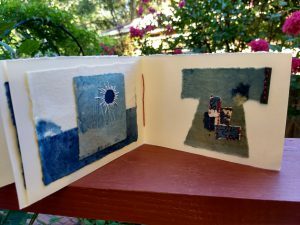 In this workshop you will make two books with art paper pages and a sturdy cover. 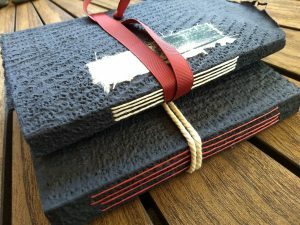 The binding is simple and there will be time to personalise your book and the book you are giving away. You can make them the same size or make one smaller than the other. 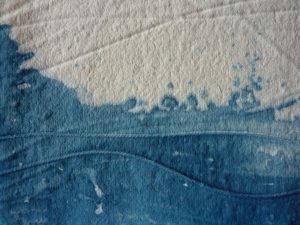 During this 2 session workshop, the fascinating process of dyeing in the Indigo vat will be explored in detail. 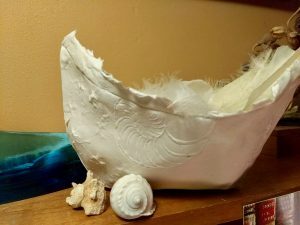 On the first day you will learn how to wrap, clamp, roll, fold and dip your papers in a variety of ways using a wide variety of commercial and handmade papers. 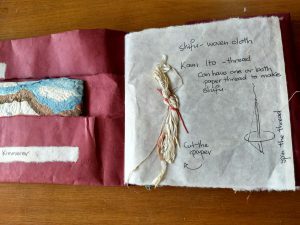 You will dye the fabric for the cover of your book, which you will make in the second session. 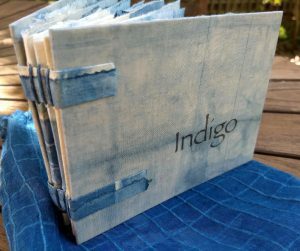 Day two is an afternoon session, where you will assemble your beautifully dyed book pages and stitch them together with the indigo dyed thread. This book will be a wonderful place to to display your attractive papers and record what you have learnt about Indigo. Cost: $100 plus $15 materials fee. Papermakers of Victoria web site. Cost: $80.00 for members, $100.00 for non-members. 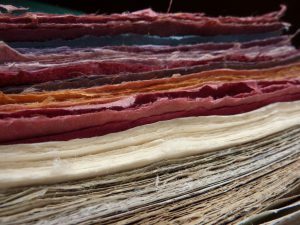 This workshop will introduce you to the skill of hand papermaking with recycled pulp of different colours. You will learn about the preparation and choice of materials for pulp, how to form a sheet of paper and the pressing and drying of your paper. Pulp will be provided by the tutor. 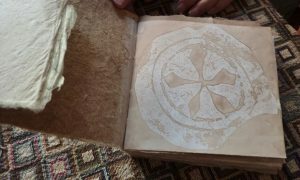 This workshop would also be suitable for papermakers who can make paper and want to extend their skills. Thankyou to you all for showing interest in my paper art. I am about to send out my newsletter. If you have not already subscribed you may like to go to my web site barbadams.com and subscribe. You will then receive my newsletter and find out some of the things I have planned for 2019. BYO lunch, tea and coffee provided. 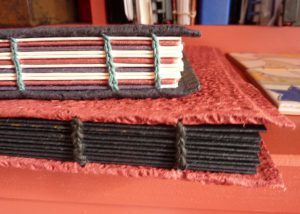 Spend a cosy Sunday together learning the skill of book binding. 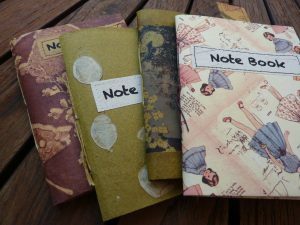 We will make a lovely ‘take anywhere’ journal with a wrap around cover and a simple notebook which you can teach others to make later. No experience necessary. 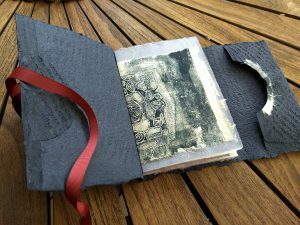 Make a book that is ALL YOURS right from the paper itself . 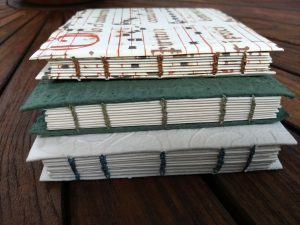 Spend three wonderful days during the month of July learning the skills of making paper, stitching two book structures and binding a very special book with the paper you made on day one. Bind your own paper into one of your book styles. Venue: Box Hill North – details on registration. 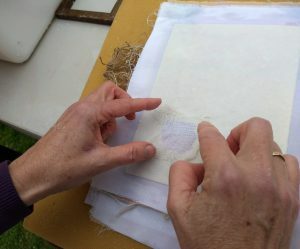 Have you stitched on paper? Sashiko stitching in the Japanese boro style can be used to make attractive designs on paper. 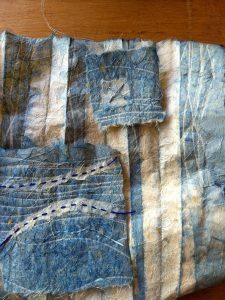 Boro stitched fabric grew out of the need to repair old Indigo dyed cloth in early twentieth century rural Japan. 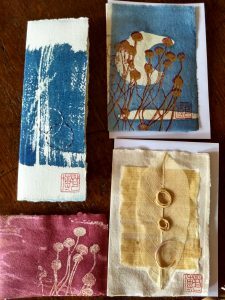 This workshop will introduce you to different ways of stitching Indigo dyed papers to create beautiful mini artworks for the pages for your book. You will be guided to use the marks on the paper as a suggested design for your page. 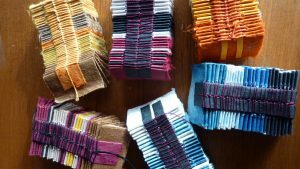 You will learn some basic sashiko designs and how to use them in your work. At the end of the day you will take home a beautiful little book to keep or give to someone special. Your materials fee will include the papers Barb provides to make and decorate your book. 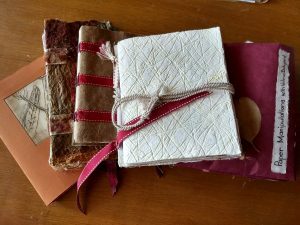 Spend three wonderful days during the month of May learning the skills of making paper, stitching two book structures and binding a very special book with the paper you made on day one. Your friends will love receiving personalised gift cards from you. Start the day by carving your own print block from your drawing or a design supplied by Barb. This will be used with the cold wax resist technique and printing onto your cards. You will collage, print, stitch and dye to bring colour and life to your cards. Some cards will be made from handmade paper and others from commercial card. You will end the day with many cards to give your family and friends on special occasions. 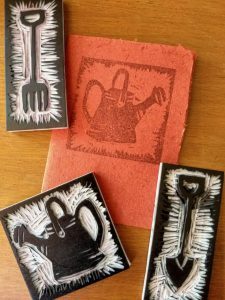 Your $10 materials fee will cover the cost of a lino tool, Soft Cut print block material and blank cards to work on. 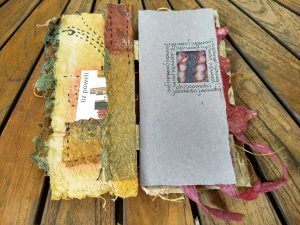 Learn to make an artistic note book to house your workshop notes and samples. They are so valuable for keeping your memory prompts and new learnings in an attractive reference book . 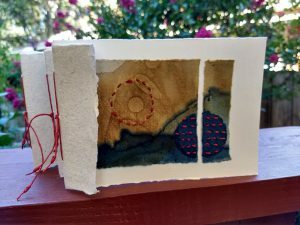 Easily accessed notes and diagrams will make your follow up days much more valuable as you weave your new skills into your developing art practice. For this workshop you will bring notes and samples from a workshop or activity you have already done. This information and your examples will be what determines the shape and style of your book. 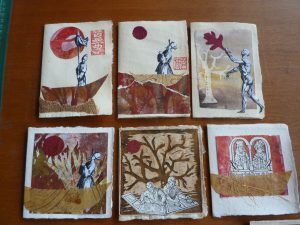 This is a Papermakers of Victoria workshop I will run at our Stables Studio at Bundoora. 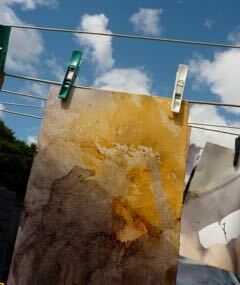 Handmade paper can vary greatly. 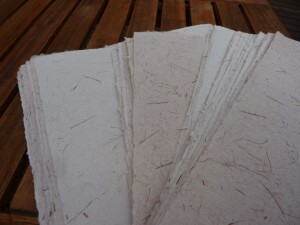 For a handmade paper project to be a success it is helpful to know which paper you should make. 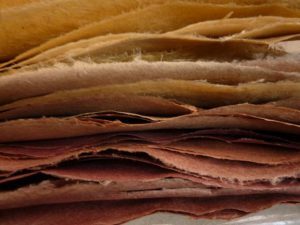 This workshop will concentrate on making a variety of pulps which will be made into sample sheets. 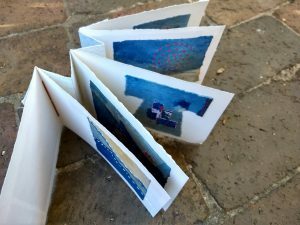 You will learn how to make paper suitable for book pages of different shapes and sizes or pages with pockets included when you form the wet pages. Recipes will be provided for pulp making suitable for cards, strong paper for casting, paper into which other items can be included or paper suitable to print photos or text onto.You will take home a book you have made, in which you can store your specific paper pulp recipes and samples of your handmade paper. 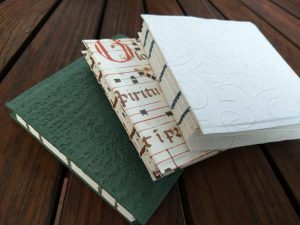 While you are at http://papermakers.org.au/workshops/ have look at the other great workshops available.